Thanks to John Handy, son in law of S/Sgt Martin E. "Marty" Eichelman (R Gunner) for information on this crew. The crew flew 35 missions. One crewmember, the left gunner, changed twice in their 35 missions. For missions 1 through 18, SSgt Stanley Mackiewicz had the position. He came down with with appendicitis, had surgery, and was replaced. The replacement gunner flew only one mission -- their worst, a lost windmilling engine that caught fire twice, with an emergency landing at Iwo Jima that almost didn't happen -- and having already been in one serious crash with fatalities, he was taken off flight status. SSgt Mario DiFerdinando, in the picture, flew with the crew for missions 20 through 35. After their 23rd mission, the crew was transferred to the 421st Bomb Squadron, 504th Bomb Group, 313th Bomb Wing along with Crew #3908. This change was effective June 16. On August 6, they flew a Super Dumbo mission in support of the 509th Bomb Squadron. 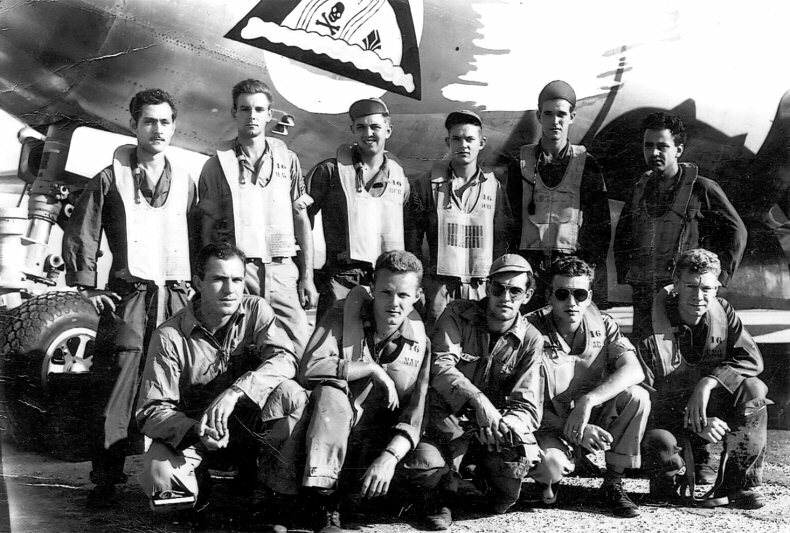 Crew #2416 at Tinian after their 20th Mission on June 1. Photo provided by John Handy, son in law of S/Sgt Martin E. "Marty" Eichelman (R Gunner), all rights reserved. Standing - Left to Right: S/Sgt Mario DiFerdinando (L Gunner), S/Sgt Martin E. "Marty" Eichelman (R Gunner), S/Sgt James W. Brooks (CFC), S/Sgt David O. Evans (Radio), Sgt Charles W. Jones (T Gunner), S/Sgt Elio S. Casal (Radarman). Kneeling - Left to Right: 1/Lt Jones D. Woodward (Pilot), 1/Lt Archie W. Miller (Navigator), 1/Lt Dennis J. Inkel (Bombardier), 1/Lt R. S. "Rocky" Dawson (A/C), 1/Lt Lawrence W. Stewart (Engineer). This crew generally flew "Our Lady".